Master Blaster(Tendulkar) and The Wall(Dravid) , the two most celebrated partners of Dada (Ganguly) , today paid tributes to their successful ex- captain and lately called as member of the 'fab four' saying the DADA had been a fount of inspiration for his teammates during his 16-year-long glorious international career. "Sourav had a way with people and inspired others with his performances " Tendulkar told 'Cricket Nirvana'. "He's had a brilliant career and I for one have thoroughly enjoyed playing with him. There have been some memorable moments that he has given to the game and also the immense joy he has given to the team," said Tendulkar. "It came as a surprise as he told us in the dressing room that he was quitting. It was towards the end of practice and I was surprised. 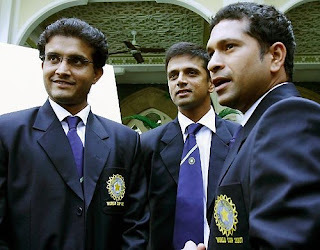 I could not even talk to him since he had to rush to the press conference," revealed Tendulkar. Dravid said Ganguly has achieved everything that any cricketer could possibly want in his career. "What more could he have asked for? He's seen it all. Played some fascinating knocks in one-dayers; batted well in Tests at home and away, won Tests abroad and led India to a World Cup final," Dravid said. It's been special to have been part of a middle-order alongside him. I hope I learnt something from him and added something to his cricket, he added. Both, however, admitted they were taken by surprise when Ganguly informed of his decision to retire after the series against Australia.